In a sodden tent at a '70s festival, the teenage Mark Ellen had a dream. He dreamt that music was a rich meadow of possibility, a liberating leap to a sparkling future, an industry of human happiness - and he wanted to be part of it. Thus began his 50-year love affair with rock and roll. From his time at the NME, Radio One, The Old Grey Whistle Test and Live aid, he has been at the molten core of pop's evolution, and watched its key figures from a unique perspective. 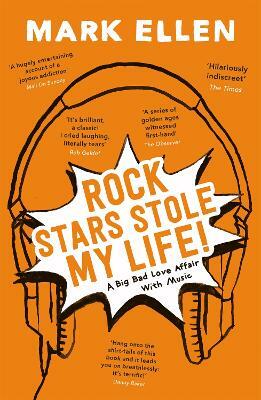 This funny and touching personal memoir maps out his eventful journey in rock and roll. It tells stories and settles scores. It charts the peaks and disappointments. It flags up surprising heroes and barbecues the dull and self-deluded. It puts a chaotic world to rights and pours petrol on the embers of a glorious industry now in spiraling decline. Award-winning writer and broadcaster Mark Ellen was born at the wrong time. Five years older and he would have seen The Beatles and The Byrds; five years younger and he'd have been plunged into punk rock. He spent his teenage years sitting at the feet of bands like Hookfoot, Wishbone Ash and Brewers Droop -- the half-baked rear guard of underground rock -- and he knew no better than to admire them. Mark went on to write for Record Mirror and New Musical Express, and edited Smash Hits, Q and Select, and helped to launch MOJO. He stood in for John Peel on Radio One and then joined the Old Grey Whistle Test, becoming one of the TV presenters of Live Aid in 1985. For ten years from 2002, he edited the much-missed music publication, The Word.